This free eBook presents the role a data fabric plays in addressing the challenges inhibiting hybrid cloud deployment, and how it protects corporate data both within and outside the corporate walls. 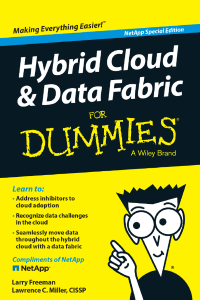 Download it and learn the seven key benefits of a hybrid cloud data fabric. Increasingly due to cloud computing—in particular the interconnection of public and private clouds and on-premise resources—is changing the role of IT organizations into that of a service broker. CIOs are looking to hybrid cloud infrastructures to create operational efficiencies, speed application deployment and increase responsiveness; however, it can be very challenging, especially around security and management of data. Organizations deploying hybrid cloud infrastructures struggle in areas of complexity, IT agility and data control while attempting to build seamless connection between multiple cloud services and cloud models. But a data fabric combines technologies to deliver cloud solutions that are focused on efficient management, movement and protection of data within the hybrid cloud.